Is A Police Report Required To Prove My Car Accident Case? You are involved in an auto accident, do you need to have a police report taken in order to prove your case? The answer may surprise you. Vehicles operated for commercial purposes—such as semi-trucks, big-rigs, buses, delivery vans, tow trucks, hotel shuttles and taxi cabs—are tasked with safely sharing the road with other vehicles and motorists. Unfortunately, that expectation isn't always a reality. Accidents between commercial and private vehicles can and do happen—and the results can be catastrophic. After suffering injuries in an accident caused by a negligent commercial driver, you may be entitled to compensation for medical expenses and other damages. Here's what you need to know before taking legal action. The at-fault commercial driver. The driver of the commercial vehicle that caused the accident is the most logical person to name in a personal injury lawsuit. However, they may not be the only one with legal liability for what occurred. The company that employs the commercial driver. 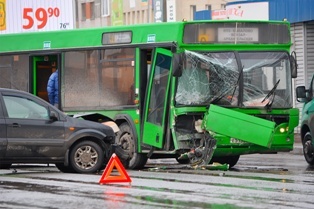 In most cases where there is an employer involved with the driver, accident victims may be able to hold the commercial driver's company responsible as well. Companies may be liable for accidents and injuries caused by their driver due to their position as an employer of the driver. Additional direct liability can arise from negligent hiring, training, and supervisory practices, imposing unrealistic schedules, or encouraging drivers to violate federal safety regulations. Manufacturers of defective commercial vehicle components. Some commercial accidents may not be caused by a driver or company's unsafe actions, but by a defectively manufactured vehicle component. In such a case, the truck or part manufacturer may share liability. The government agency tasked with maintaining the road where the accident occurred. In more rare instances, commercial vehicle accidents can be caused by defects in a poorly maintained road. In such cases, the government agency responsible for the road's upkeep and maintenance may share in liability. Victims injured in commercial vehicle accidents can seek compensation from two main categories of damages: economic and non-economic. Economic damages are quantifiable losses, such as accident-related medical expenses, property damages, lost wages, and loss of earning capacity. Non-economic losses, on the other hand, are harder to quantify and include things like physical pain and suffering, mental and emotional anguish, scarring or disfigurement, and loss of enjoyment of life. If you were injured in an accident with a commercial vehicle, it's important to understand your legal rights and options. The knowledgeable attorneys with the Inland Empire Law Group can review the facts of your case and help you explore your options for compensation. Contact the Inland Empire Law Group today at (888) 694-3529 to schedule an appointment for a free initial case consultation. I am really pleased with Inland Empire Law Group. Patricia M.
They are excellent people and we will always keep them in mind. We are 100% grateful. They are the best. Yazmin and Martin R.
I am very Satisfied with the way Inland Empire Law Group Handled my Case. Candie N.